Although technological advances have made the world seem a much smaller place, the reality is that all our members are different and have different needs. The same is true of the interests of dog owners in each country, and this is why we are seeking a way of staying constantly in touch with our member organisations. They are the ones who are looking after dogs and their owners in their respective countries every day and they have our unconditional support. The FCI offers constant support and this is why we are always listening to our sections, the FCI’s representative bodies, who work hard on behalf of the countries of which they are made up. In order to ensure that the sections can work on behalf of their members, they need to organise themselves so that they can operate in a way which represents all the sectors of their regions. During my recent visit to Asia the FCI's increased recognition was obvious, as was the interest shown by our members in the region in representing us properly and proudly. This is certainly the case with Malaysia, a country which only recently became a federated member. Over there our national organisation, the Malaysian Kennel Association has managed to develop a well-organised and genuinely exemplary love of dogs, which follows the values of our federation and implements them in its sporting, recreational and educational activities. In the same way the Philippines Canine Club, under the leadership of its chairman Mr Benedicto Santos, who now also chairs the FCI Asia and the Pacific section, has managed to make its love of dogs truly world class, bringing both the country and its dogs to the attention of the world’s dog lovers by holding a four-day show with more than 6,000 dogs registered for it. Our responsibility for the well-being of dogs is a global one and every year we reach more dog lovers. Our Americas and the Caribbean Section, chaired by Miguel Ángel Martínez, has achieved worldwide recognition by holding global events and developing educational programmes which have set an example all over the world. Although our head office is in Europe, our European section has one of our organisation’s biggest responsibilities as it is made up of our founding countries, who forged the history of the worldwide love of dogs at the same time as we are adding new members to our organisation from countries which have recently joined. Mr Jorgen Hindse is doing a superb job as chairman, preserving the historic legacy of our founding members without overlooking our responsibility to the future development of our organisation. 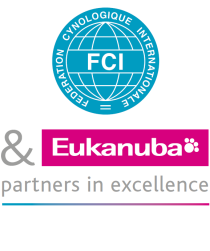 The worldwide development and expansion of the FCI does not simply mean getting bigger; it means fulfilling our mission statement, which is to look after the well-being and health of all dogs worldwide.